Utah Trikes - Are Trikes Safe? At Utah Trikes we see a myriad of customers who have different reasons for being interested in our Trikes. Some enjoy the comfort of recumbent trikes. 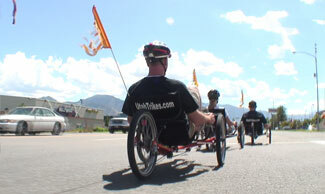 Others like the speed and aerodynamics that a recumbent trike's unique design offers. Occasionally we�ll get people asking if our trikes are safe. Their main reason for asking this is due to many Tadpole Recumbent Trikes being lower to the ground than a standard diamond frame bike. While being closer to the ground in a recumbent position can help with wind resistance and comfort, some people are concerned. I commute to work on my Trike. It�s my main commuting vehicle. Because of the unique shape of the Trike, I�ve found most people in cars go out of their way to slow down and take a closer look. Bikes are so common place that at times we tend to subconsciously blend them into the scenery. Especially if they�re not following the bicycle safety laws by riding on the sidewalks instead of with traffic. One way to assist in being seen is to follow your local safety laws and ride with the direction of traffic in your bike lane or as close to the side of the road as possible. Another way to ensure that your trike ride is a safe one is to enhance your visibility using a brightly colored safety flag, safety helmet, and to dress in highly visible colors. Some accessories can assist in making you more noticeable like carrying bags, a fairing (windshield) or tailsok. Having a safety flag can make you more visible to larger vehicles. Other items such as an air horn will help others notice you, and adding accessories like a mirror will keep you aware of what�s going on around you. Because many Tadpole Trikes sit lower to the ground, it makes the vehicle more aerodynamic like a sports car. And much like a sports car, the trike has a very similar height. While commuting on my Trike, I can usually make eye contact with the driver of any vehicle next to me that is average sedan size or shorter. Still, with any vehicle on the road, even if I feel I�ve made eye contact or that they see me, I ride defensively. If you just assume that you�re invisible, you�ll remain very safe. The trike itself is also a very safe human powered vehicle. On a tadpole recumbent trike you sit between the front wheels, your body weight is more properly centered, making it extremely difficult to tip over. Also, having two wheels in front to steer rather than the one wheel steering in front, it adds stability making it more difficult to flip the trike. Also, on a Trike, if you hit a rock or pothole, you will not flip head over heals onto the pavement. About the worst I�ve ever experienced is having your feet come off the pedals. And that can be easily fixed with clipless pedals (also called clip-in or step-in pedals). On a Delta trike, much of the steering instability can be fixed by increasing the length of the trike and lowering the rider. Traditionally though, most Delta trikes place the rider higher off the ground than a tadpole trike. Still, in my test riding, the tadpole trikes can take high speed turns better than a Delta Trike. While riding in traffic, I�ve found that vehicles tend to give you the full legal three feet (if not more) of distance between you and their vehicle. When I used to ride my standard diamond frame bike to work, I�d have some amazingly close calls. I don�t know if people looking at the width of the bike tires hitting the road assume that the entire bike including the rider must also be that wide, but I rarely would get anyone giving me the proper amount of space on my bike. Also, on my bike, I couldn�t really skirt the edge of the asphalt for fear that one slight variation on the road would flip me off my bike and into the side ditch. On a Trike, there is no fear like that. I feel safe that if one wheel went slightly off the road and into the dirt I wouldn�t completely loose control. The overall stability advantage makes recumbent trikes a very safe pedal vehicle to ride.